Aigang goal is to adopt prediction markets to Insurance space and make them useful for better-balanced insurance products. Each organized prediction output should help an owner to make the decision based on crowd opinion. These collected opinions should help to shape new insurance products. 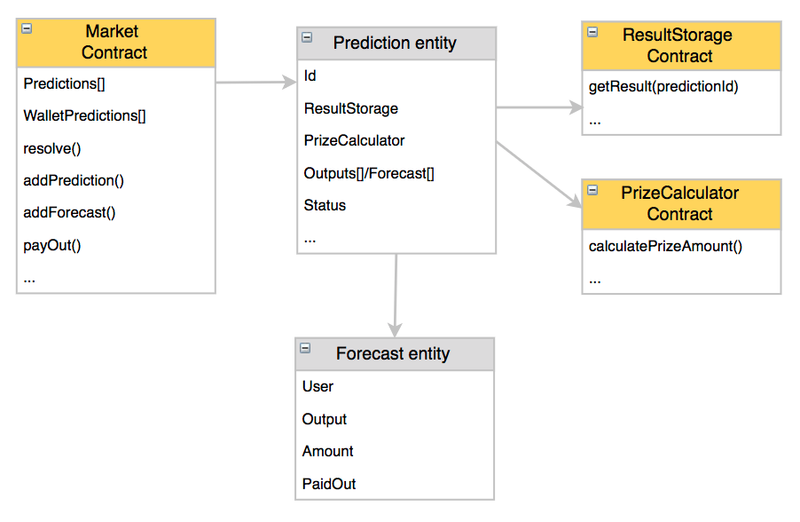 - Winning prediction output payouts function where users or organizer will distribute rewards. - Canceled, the prediction is suspended and participants are allowed to withdraw they forecast amount. After the prediction resolves, the Oracle decides the winning outcome is Outcome 1. Outside of blockchain each participant will receive Scores which will participate in statistics. ResultStorage store all predictions resolutions. The contract will be connected with our oracle service which will solve predictions. At this moment 3rd party services like http://www.oraclize.it/ are not stable, have limited support, expensive and execution flow is not traceable. When we allow users to create predictions by themselves this part becomes extremely complex and we think that this functionality is a key feature. Having own oracle service will be much flexible solution and in the future, this solution can act as a proxy to better 3rd party oracles.